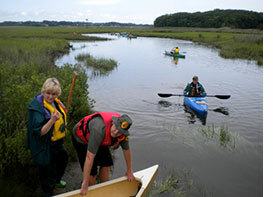 (16/55) TRENTON – The New Jersey Division of Parks and Forestry has launched a kayaking eco-tour program that gives participants a close-up perspective on the ecosystems of Cheesequake State Park, a unique oasis of coastal marshes and forests tucked away amid heavily developed Middlesex County. Kayak tours are $15 per person. Available dates include Saturday, June 18; Saturday, June 25; Saturday, July 2; Sunday, July 10; Saturday, July 23; Sunday, July 31; and Saturday, August 6. Pre-registration is required by calling (732) 566-3208. 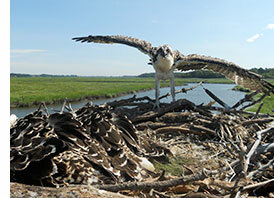 You will be asked to process your payment through the park office by calling (732) 566-2161. Payment is not refundable unless severe weather forces cancellation. Call the park office a day ahead to check the weather forecast. Kayaks are provided by the park. Experienced paddlers may bring their own kayaks (canoes are not permissible when park boats are fully booked). Participants must be at least 14 years old, able to swim, and in good physical condition as they will be required to sit upright in the kayak for long stretches. Each tour begins at 9:30 a.m. and ends around 1 p.m. Availability may be limited. You will be required to pay the park vehicle entrance fee. The tours are led by park naturalist Jim Faczak, who will provide fascinating insights into salt marsh habitats, birds, animals and history. 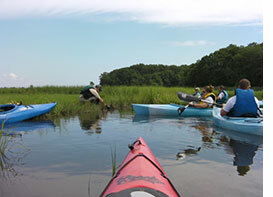 The kayak tours provide close-up views of fiddler crabs, shrimp, sea pickles, mussels and perhaps even pelicans and osprey, also known as fish hawks. There are even occasional sightings of bald eagles. When you’re done kayaking, you may want to consider hiking the park’s network of trails, or using the specially designated White Trail, open to both hikers and mountain bikers. The park’s campground offers more than 40 tent and trailer sites for those interested in making a weekend of their kayak tour. Same-day walk-in reservations are accepted, depending on availability. If you’re bringing your own kayak, it must arrive at the park maintenance lot no later than 8:30 a.m. A park truck will transport it to the launch point. Tours leave at 9:30 a.m. from the crabbing bridge. (Follow the signs to the lake and park at the lot near the pavilion; facing the lake, the bridge is at the right end of the lot.) Plan to arrive at the crabbing bridge no later than 9:15 a.m.
You are required to bring at least two bottles of water. It is also strongly recommended that you bring a lunch and snacks, sunscreen, bug repellant, rain gear, towel to sit on, dry sack or plastic bag to store personal items, polypropylene cord to lash the bag to the kayak, laminated ID, and spare car keys. Wearing jewelry is not recommended. You should wear sneakers, synthetic clothing (which dries more quickly if wet), hat, sunglasses and eye-glass retainers. Open-toe sandals, flip-flops, jeans, and hiking boots are not recommended. Smoking and pets are not allowed. Restroom facilities are not available on the tour route.